With a food processor running, drop the garlic through the feed tube to mince it. 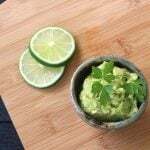 Stop the processor and add cilantro/parsley, olive oil, avocado, lime juice (you can squeeze it right into the food processor), salt, and pepper. If you have a large lime instead of a smaller one, only use the juice from half of it.